Shoosmiths is a major UK law firm with 10 offices across the UK. Their clients are a diverse and exciting range of private and publicly listed organisations – from large multi-national corporates to smaller, ambitious, high-growth businesses. Shoosmiths has won Law Firm of the Year at the prestigious M&A awards in 2013 and 2015 and has been short-listed for the 2015 UK Law Society Excellence Awards. In 2014 the firm embarked on an ambitious strategic IT programme to replace and renew its aging infrastructure and complex applications architecture, by virtualising the former and simplifying the latter. The Practice Management System was replaced by SAP and the entire desktop environment – approximately 1,000 seats – was upgraded from Windows XP/Office 2003 to Windows 7/Office 2013. An important part of this desktop upgrade was the replacement of the Document Management System (DMS) by a solution based on Microsoft SharePoint and MacroView Document Management Framework (DMF). DM v6 (DM6). This had been deployed for over nine years. Development of DM6 had ceased in 2008, following the acquisition by OpenText. Along with the implementation of SAP Shoosmiths deployed the Duet middleware solution which integrates SAP with Microsoft SharePoint and Office. A key element in the firm’s digital strategy was to exploit this integration to allow the application architecture to be simplified and to exploit the multimedia content management capabilities of SharePoint. Shoosmiths was also keen to future-proof their systems to allow for potential technology consolidation. They wanted to create a digital workplace taking advantage of SharePoint, workflow, enterprise search and providing a strategic platform for content sharing both internally and externally to clients. 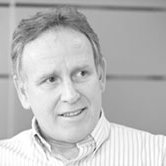 Recognising that native SharePoint does not provide the required functionality to provide an intuitive “legal friendly” interface supporting the complexities associated with legal document production and management, Shoosmiths looked for a SharePoint “add-in” that could bridge this gap. After extensive evaluation of different products / approaches, Shoosmiths selected MacroView DMF to bridge this gap. The MacroView DMF product provided all the required functionality with tight integration into MS Office, simple but comprehensive metadata capture, excellent search capabilities and comprehensive e-mail filing capabilities. Importantly MacroView DMF utilized the multi-media capabilities of SharePoint to store all documents and emails. The implementation of MacroView DMF was made quite complex by the need to dovetail into multiple projects, including the implementation of SAP and the migration from Win XP/Office 2003 to Win 7/Office 2013. In addition there was the requirement to migrate and map document permissions for over 6 million documents to ensure that security of documents was consistent between DM6 and MacroView. Integration between SAP and MacroView via Duet allows a seamless client / matter inception process which automates the creation of standard document libraries based on Work Type in MacroView. Equally, all documents generated in SAP (conflict checks, AML documentation, invoices and statements) are all captured and stored in MacroView, in addition to the transactional documentation. This provides a comprehensive and consistent content store for every document associated with a client transaction which provides a strategic resource that can be exploited to provide new client services. Shoosmiths completed the migration in June 2015, with almost 900 users transitioned to the new MacroView/SharePoint Document Management System. 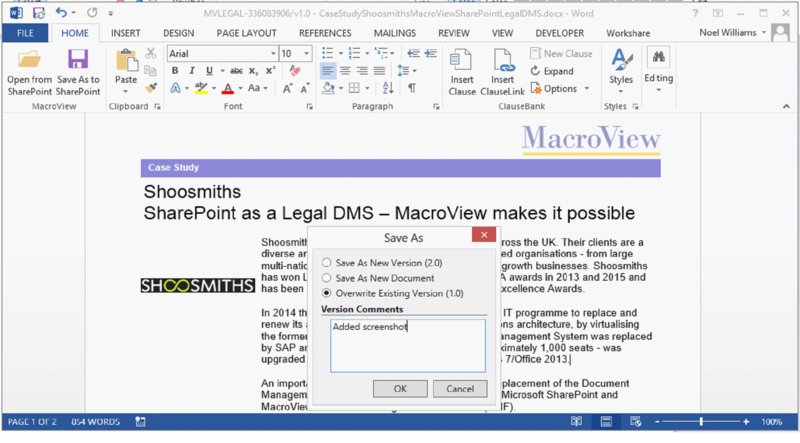 MacroView DMF is providing tight integration between SharePoint, Word, Excel, PowerPoint, Adobe Reader, the Windows desktop and Outlook for efficient email management, through a simple but powerful and consistent interface. In addition to dramatically reducing the time to find documents the MacroView DMF solution has made the retrieval and storage of documents and emails intuitive for users and easy to administer. The MacroView solution has provided a more consistent user experience by standardising the way information is held and shared. It also has benefits in relation to satisfying compliance requirements in that all compliance documentation generated during the client / matter inception process is automatically stored in MacroView. Shoosmiths now operate a platform capable of dealing with any Client/Matter content types rather than just documents. In effect the platform now is ready to deliver Client/Matter workspaces, collaboration areas and much more. It also facilitates the next step in Shoosmiths digital strategy which integrates SharePoint workflows and document management into a client portal which will enhance client collaboration and optimise working practices.